In response to a number of requests, we are happy to inform you that the dead line for early registration to the 12th IWGS is extended until June 30 July 15, 2013. *1 Students are required to submit a copy of their student ID to the Registration Desk by e-mail or fax. *2 An Accompanying Person must be a spouse or a family member of the registered. Please make the payment at the On-site Registration Desk. *Please refer to the "Optional Tours" page for this schedule. *All payment must be in Japanese yen. The confirmation letter and receipt will be printable online after completing the registration. Confirmation can be printed as many times as you want at anytime during registration by September14, 2013. A receipt can only be printed once. Please inquire the registration desk if you failed to print. To visit Japan, you must have a valid passport. A visa is required for citizens of countries that do not have visa-exempt agreements with Japan. 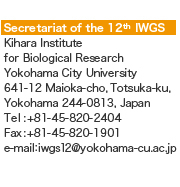 If you need a symposium invitation letter to arrange VISA, kindly contact with registration desk:iwgs2013reg@convention.co.jp. after your official registration. You will be able to use the same ID and password for Registration and Abstract Submission. For Accommodation and Excursion, ID and Password are different from Registration and Abstract Submission.